After two miles of easy skiing across stark Echo Lakes you may want to venture beyond to explore and enjoy some of the nearby slopes and have the opportunity to look back and down on the lakes. Trekking on to Tamarack Lake is a great way to add a destination to your exploration. Tamarack Lake is nestled in a little basin of its own and up against slopes much steeper than the ones you ascend to reach it. These slopes to the south and west of the lake guarantee that the lake will be shrouded in shade the entire winter; don't journey here thinking that you are going to spend a sunny afternoon lunchtime. From Tamarack Lake it is only a short ski south to Ralston Lake and Cagwin Lake if you have more energy to burn. Tamarack Lake is also just off the longer route to Desolation Valley. Lastly, according to the Forest Service you must obtain a permit for day use as well as overnight camping in Desolation Wilderness. Desolation Wilderness begins approximately one-half mile west of Upper Echo Lake, which puts Tamarack Lake just inside the Wilderness. Ski west, at first climbing gradually and as you near the lake more steeply, for a total of 0.9 mile until you reach Tamarack Lake (6). 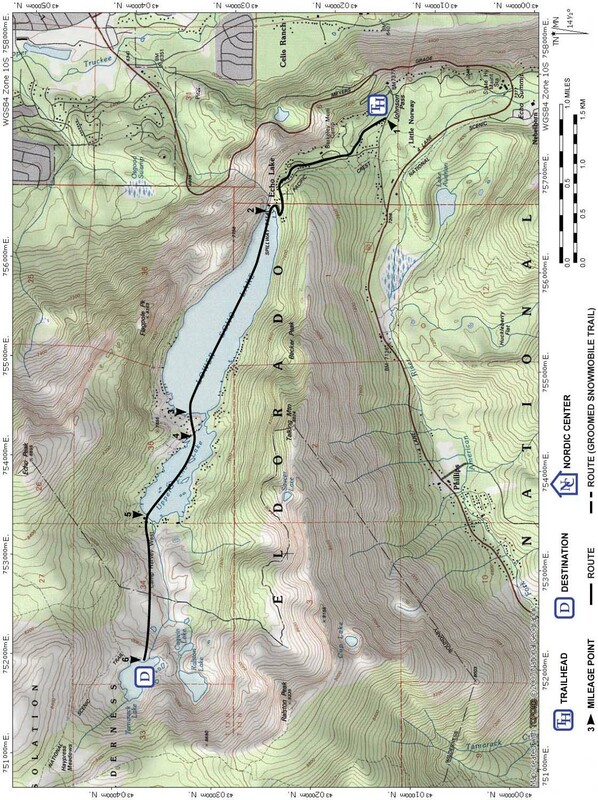 Retrace the route for 4.2 miles back to the trailhead (1).